Despite having finished all my Christmas shopping in October and November, I had somehow forgotten about my BFF Sophia. 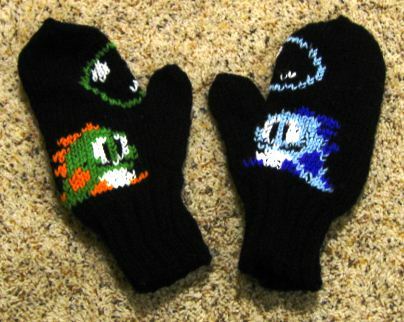 ::gasp:: Well, on my wish list of things to make for her was this pair of Bubble Bobble mittens. 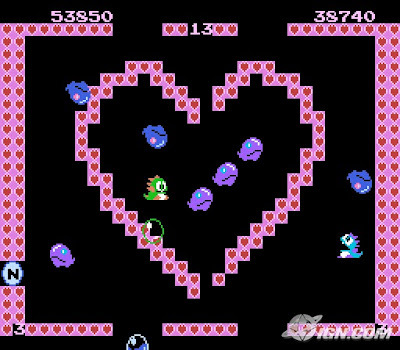 As kids, we used to play Bubble Bobble all the time on the SNES at her place, so this was sure to give her a blast of nostalgia. 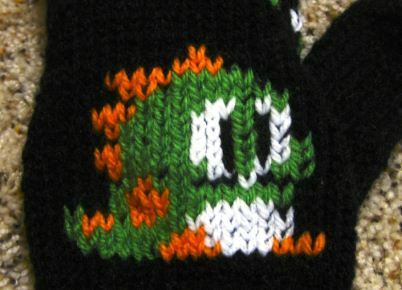 Instead of using intarsia in the round, I happily substituted with duplicate stitching. Unfortunately, as with most projects, my first mitten didn't turn out as nicely as the second one. The cuff was waaay too loose, but I was in no mood to make a third mitten. So I took a deep breath, sliced off the oversized cuff, and redid it using these instructions and a neato stretchy bind-off. What an adventure; hope Sophia likes 'em!